Ace, the smallest male of Callie's litter is a spunky little dog. 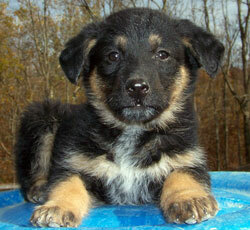 He and his siblings were all found with their mom Callie in rural Indiana. They have been in foster care since the day after being picked up. The puppies have been living the good life on the farm with their foster mom & all the other animals so they are well adjusted and socialized with farm animals. They are happy, healthy playful puppies that enjoy the days outside romping & napping & spend their nights in their pens sleeping off their dinner. They have had a diet of kibble and fresh venison and are hearty eaters. They are all chubby little puppies that adore belly rubs and lots of attention. They love to wrestle the younger cats & aggravate the older one's, but they have learned very quickly to respect the senior cats and to go on their way to other activities. They are all very sweet puppies waiting for their forever homes. Hi! My name is Bailey and I like to play. I love my dog friends and love kids too, especially teen agers. I'm trying to learn to chase a frisbee, but for now a ball is all I can handle. Won't you adopt me? I'm 3 months old and they thought I had some beagle, but once they had me for awhile and looked me over more closely, they realized i'm an English Bulldog mix. I'm really cute and super cuddly. I think if you met me, you would fall in love. 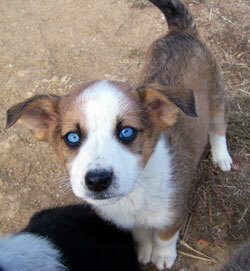 I'm crate trained and I have soft white fur and love to sit on your lap. Apply at www.saveadog.org. Boomer is 2 yr old neutered male Norwegian Elkhound mixed with Retriever (shape of head is like a Golden) who weighs around 35-40 lbs. He has been neutered for some time, so he does not mark. He's a really nice dog who gets along with everybody. He is a very gentle dog who appears to be house trained. He's great with female dogs. He has a mild personality so he is not a pal for rambuncious dogs as he's gentle, not a rough player. Available as of 11/20/10. Please apply on our Web site to speed the application process. Hi! My name is Brady and I am a sweet boy. I am great with kids and grew up with toddlers in the house. I'm also great with cats and dogs. My family lost their jobs and then their home. They live in an apartment, and the landlord let me come, but the place is too small and my family can no longer afford to keep me. I'm a good dog, house trained, no bad habits, well past the puppy stage, and will be your best friend. Will you give me a chance? I want a forever home to live out my life. Please apply online at Save A Dog so that I can be here to meet you when you arrive. Note from Save A Dog: Due to the family's hardship, we are waiving the intake fee, therefore donations are warmly accepted. Camille and Brie, along with their brothers, were all found with their mom Callie in rural Indiana. They have been in foster care since the day after being picked up. The puppies have been living the good life on the farm with their foster mom & all the other animals so they are well adjusted and socialized with farm animals. They are happy, healthy playful puppies that enjoy the days outside romping & napping & spend their nights in their pens sleeping off their dinner. They have had a diet of kibble and fresh venison and are hearty eaters. They are all chubby little puppies that adore belly rubs and lots of attention. They love to wrestle the younger cats & aggravate the older one's, but they have learned very quickly to respect the senior cats and to go on their way to other activities. They are all very sweet puppies waiting for their forever homes. Please fill out the application first if you can so the Save A Dog staff can print it out when you come in to meet them. They are available as of 11/20. Camille and Brie, along with their brothers, were all found with their mom Callie in rural Indiana. They have been in foster care since the day after being picked up. The puppies have been living the good life on the farm with their foster mom & all the other animals so they are well adjusted and socialized with farm animals. They are happy, healthy playful puppies that enjoy the days outside romping & napping & spend their nights in their pens sleeping off their dinner. They have had a diet of kibble and fresh venison and are hearty eaters. They are all chubby little puppies that adore belly rubs and lots of attention. They love to wrestle the younger cats & aggravate the older one's, but they have learned very quickly to respect the senior cats and to go on their way to other activities. They are all very sweet puppies waiting for their forever homes. 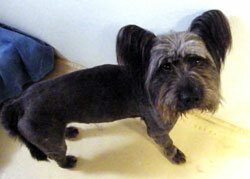 Chewbacca is a 2 year old male Skye terrier who was turned in by his owner through no fault of his own. He is a very sweet boy. He will be neutered on Tuesday 11/23/10 and available shortly afterwards. 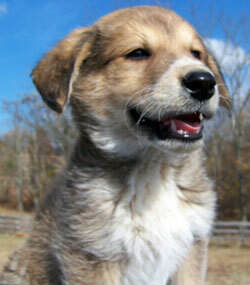 Cody is one of Callie's male pups who, when rescued, had very crooked legs. We're thinking he had a mild case of rickets due to poor nutrition. The foster mom taped his legs and gave him a diet of kibble with some fresh raw venison and he blossomed from there. You can see his "before and after" pictures here. He has quite a personality and deserves a loving adopter who will pull out all stops to make sure he has the best life ever from here on out. We recommend delaying the neutering for him until he is full grown as pediatric neutering can affect bone development. Cody, Oliver, Ace, and Eli were all found with their mom Callie in rural Indiana. They have been in foster care since the day after being picked up. The puppies have been living the good life on the farm with their foster mom & all the other animals so they are well adjusted and socialized with farm animals. They are happy, healthy playful puppies that enjoy the days outside romping & napping & spend their nights in their pens sleeping off their dinner. They have had a diet of kibble and fresh venison and are hearty eaters. They are all chubby little puppies that adore belly rubs and lots of attention. They love to wrestle the younger cats & aggravate the older one's, but they have learned very quickly to respect the senior cats and to go on their way to other activities. They are all very sweet puppies waiting for their forever homes. Please fill out the application first if you can so the Save A Dog staff can print it out when you come in to meet them. They are available as of 11/20. 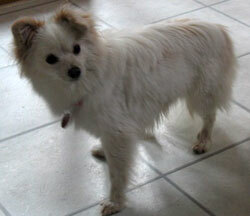 I am an adorable Papillon/Pom mix who needs a home! I weigh 9 lbs. and my coat is pure white and clean. I have peach-colored ears. One stands up and one flops over. I wag my tail and warm up to people very quickly. I would love a home with teens and up as I may not have any experience with children. Please apply online so the gang at Save A Dog can take a look at your information as I am in a foster home and I want to make sure I am there if you want to meet me! Hi, my name is Din Din. I'm a 4 month old pup and I love to play or just be petted. I will chase a ball too. I have a nice clean white coat that's spotted underneath. 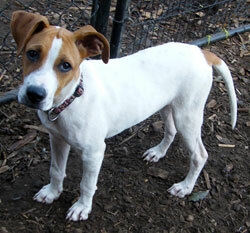 The shelter people are guessing I have Pointer or Boxer in me. It doesn't matter to me. 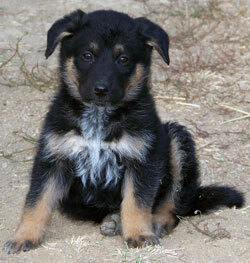 I was an orphan pup who was bottle fed by volunteers, so I have never had a real family of my own. I just want someone to love me and take me to my forever home! Here's what my foster mom says about me: What an awesome dog! He's great with my senior dog, submissive with the cats, and excellent with the kids! He would be amazing with a family with children. He is so smart and listens so well. Please apply online to speed the process as he is in afoster home and we want to make sure he is here to meet you when you come!. UPDATE: Dixie has been adopted! Thank you so much to all her supporters for getting her to this point and a HUGE thanks to Kate Flather, her foster mom! Check out her Success Story on the Web site. 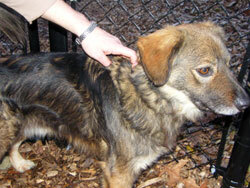 History: Dixie is a petite 10 month old VERY SWEET Australian Shepherd mix with a naturally bobbed tail. She weighs about 26 pounds and is a really nice size. She is a delightful, somewhat shy little girl who is coming out of her shell. She really shines when she's with another dog, so she would be great as a pal for another dog (not left outside, though). 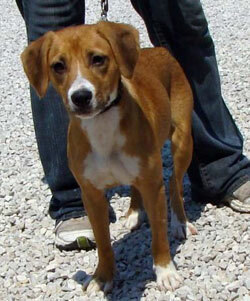 She would do great in a quiet home with a single woman or adult females as she's a little timid with men. She would be fine with girls too as she likes children. Ideally a one or two person home would be great for her. Here is a note from her foster mom, "She is doing well. She is a puppy and very silly! She is a sweetheart. She plays hard with one of the cats (they both LOVE it). She has the perkiest ears - I love them! And that tail - again, it looks like bumble bee wings! She wags it so fast - it's so funny since it is so short. 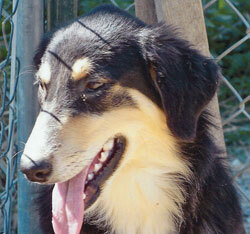 She is very sweet, attends obedience training at Save A Dog, and is a fast learner." She is in a foster home and we would be able to set up an appointment once an application is received. 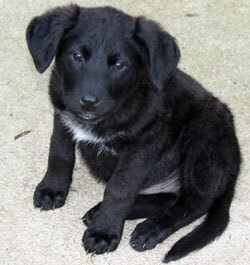 Eli is a 12 week old gentle black fluffy male dog who was rescued along with his litter mates and mom. Cody, Ace, and Eli were all found with their mom Callie in rural Indiana. They have been in foster care since the day after being picked up. The puppies have been living the good life on the farm with their foster mom & all the other animals so they are well adjusted and socialized with farm animals. They are happy, healthy playful puppies that enjoy the days outside romping & napping & spend their nights in their pens sleeping off their dinner. They have had a diet of kibble and fresh venison and are hearty eaters. They are all chubby little puppies that adore belly rubs and lots of attention. They love to wrestle the younger cats & aggravate the older one's, but they have learned very quickly to respect the senior cats and to go on their way to other activities. 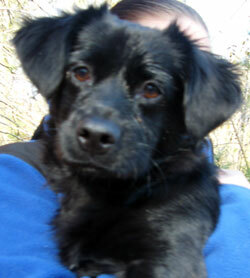 Elly is an adorable 17 lb Spaniel/Dachshund mix who needs a loving home. She is 100% puppy when it comes to playing with her toys, greeting other dogs, and just running around. She loves her toys, she's good in the crate. She likes to fetch, and is working on drop it. She just adorable. Once she's finished playing, she is the perfect little lap dog as she like to curl up in your lap and take a nap. Here's her story: She was a stray from Massachusetts who was picked up by Animal Control and ended up in a busy shelter. She had bilateral cherry eyes, which are very correctable, so we offered to take her, to give her an extreme make-over and put her up for adoption. Here's her beautiful new picture following her surgery. Her eyesight is 20/20 and she just needs to wear the cone for a few more weeks, but is ready for her forever home now. Please call for an appointment and fill out an application online to speed the process. She's awfully cute. Once you meet her, you will want her. Donations for her surgery are warmly accepted. Hi! My name is Fannie. Isn't that a crazy name! I am 2 year old and weigh about 18 lbs so I'm little. My foster mom says I am as SHARP as a tack. She calls me her little crackerjack! I'm already house trained and walk beautifully on leash so I'm ready for you to take me on daily walks. I love other dogs, in fact I would be a little sad without another dog to play with as I had many brothers and sisters in my first home. My owner died and all of us were rescued. I can be a little shy at first but once I warm up, watch out cuz I will be your little shadow. 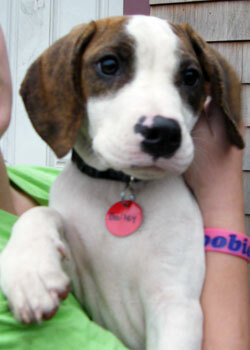 I am being fostered in Massachusetts with 2 other dogs and enjoy walking in my harness and strutting around town. Everyone thinks I am cute! My foster mom says she loves to feel my nose on her leg as I walk with her around the house.! I love to get pets and scratches. I will be a great companion for someone active who can also be a good trainer, because I listen well too. I am housetrained to go outside ( I alerted my foster mom the other night, but also can use newspaper). Please adopt me! I will be your bestest friend! Just go to the Web site, www.saveadog.org and select Apply to Adopt. Hi, my name is Jacob and I'm looking for a family where someone will play with me. I like to chase a ball or play tug. Sometimes i like to sit in your lap and be petted. See the picture where my tail is all a-blurr... that's because it's wagging non-stop. I'm a little guy even though my pictures make me look big. Shelter notes:Jacob is a petite 20 lb. 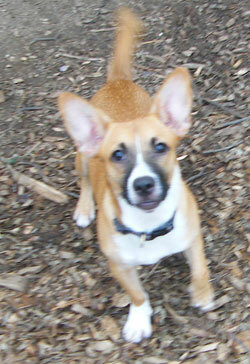 little neutered male dog who has ears like a Corgi and the body of a small terrier, possibly a Jack Russell. He's a cute guy, peppy, and affectionate, but not for small children or someone elderly. He's really adorable and is a nice size for a smaller home or condo. Please apply online to speed the process. 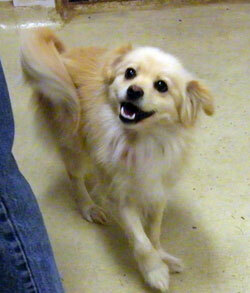 Lady is a 1 year old female Pom mix who ended up in a Massachusetts shelter and heart worm positive. Save A Dog has her now and we are doing the heart worm treatment using the safer/slow method, so we are looking for the right adopter who is willing to follow our vet's protocol for treatment (paid for by Save A Dog). 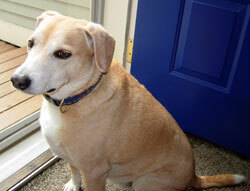 It's an easy protocol that involves giving a pill and there is no confinement as is typical of heart worm treatment. 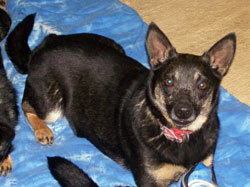 She is an adorably affectionate little girl who just loves everyone she meets. She has puppy play energy, but also enjoys being a lap dog. She is worth the time investment getting her through the heart worm recovery and she will be less likely to get cancer later in life. Please apply online to streamline the process. Hi my name is Madi. 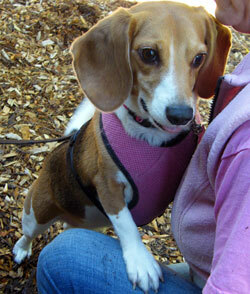 I'm a tiny, very affectionate, four year old spayed female Beagle. My mommy and daddy have to give me up because the toddler has allergies. I'm a good girl, friendly with everyone. My tail never stops wagging. I need some training. I only know sit, but I need help learning to walk on leash, although I'm small so it is not such a big deal. The main thing I need help with is house training. My parents didn't understand about crate training but if you are someone who can teach me, I will be your forever friend. Someone who works part time might be able to give me the structure as I will be able to hold it for a few hours while you're gone and then if you get me right outside, I will learn to do my business outside. I am available to meet now. Please apply online at www.saveadog.org to speed the process. 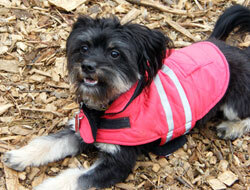 Marley is an adorable 1-3 year old Yorkie or Silkie possibly mixed with Shih Tzu. 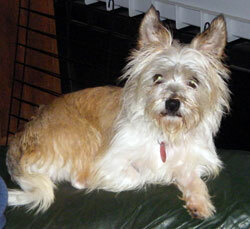 We are looking for a family with terrier breed experience (as he has typical terrier behaviors). He weighs 9 lbs and is full of puppy energy. We call him the jumping bean because he can jump about 4 feet straight up in the air. He likes to play but gets wound up like a top so he should not go with anyone elderly or with small children. He's neutered and is no longer marking in the house, but with such a tiny bladder, he will need someone who can let him out every few hours. He's not a dog to be stuck in a crate all day as he wants to play, play, play. No phone calls please. Please fill out th application online to speed the process. Oliver is the largest, gentlest male in the litter of Callie's puppies. Cody, Ace, and Eli were all found with their mom Callie in rural Indiana. They have been in foster care since the day after being picked up. The puppies have been living the good life on the farm with their foster mom & all the other animals so they are well adjusted and socialized with farm animals. They are happy, healthy playful puppies that enjoy the days outside romping & napping & spend their nights in their pens sleeping off their dinner. They have had a diet of kibble and fresh venison and are hearty eaters. They are all chubby little puppies that adore belly rubs and lots of attention. They love to wrestle the younger cats & aggravate the older one's, but they have learned very quickly to respect the senior cats and to go on their way to other activities. They are all very sweet puppies waiting for their forever homes. Please fill out the application first if you can so the Save A Dog staff can print it out when you come in to meet them. They are available as of 11/20. 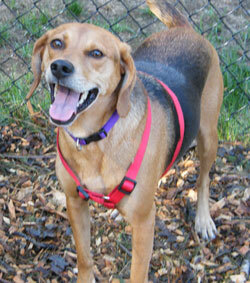 Penny is a beautiful mixed breed (some beagle maybe, possibly some lab, hard to say what she is, heinz 57), 20-month SPAYED female, who is medium-sized and wants to play. Penny simply ADORES people! She is friendly and eager to meet new friends. Penny gets along great with other pets, and is great with cats. She has been great with other dogs. She needs daily exercise, not just a quick walk. 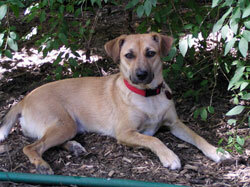 Penny would be a great family pet or as a playmate for another dog as long as she gets a lot of "people time!" She got all A's on her temperament test and she is healthy and up to date on vaccines. Please fill out an application to speed the process. She's waiting to meet you. Hi, my name is Sandi. 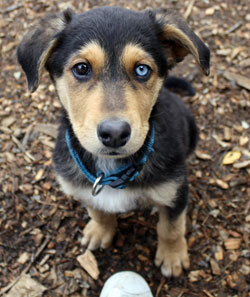 I'm a gorgeous Collie mix. I'm about a year old and am originally from Indiana. I love all the volunteers at the kennel and they love me. I can be a little shy when you first meet me but soon I am cuddling in your arms and giving sweet kisses. I love to run around in the yard with my buddy, Lady. I am very gentle with her even though she is much smaller than me. It is time for me to find a family of my own and I hope you may be the one!. Please apply online first so you don't miss out on adopting me. Hi, My name is Sport, probably because I'm a good Sport about everything. I am a tail wagger and get along with all my friends, which is everybody I meet: dogs, cats, kids (tweens and above). I'm 4, so I'm calm in the house and a good boy, no messes. I'm eager to get into my new home and to bond with my family. 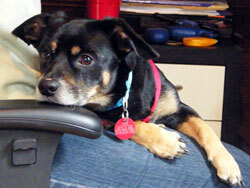 Stats: Sport is about 4 yrs old.He is house trained,already neutered and loves other dogs. His foster mom says about him: Sport was nervous here when he first arrived but after a few days he settled in well, and greets us warmly in the morning and when we come home if Newell and or I have been away from home. He loves walks and runs to me as soon as he hears the rattle of the buckles of the harness and dives right into the head-hole for me to put the harness on. He's good on a leash, doesn't pull, except for squirrels/bunnies, etc. He's great in the car. He crates well and appears to have been trained not to go on furniture nor upstairs. He's happy sleeping in a bed or the crate. We've allowed him on one couch here because Dixie does, but I'm sure he'd understand this quickly that he's not welcome on a couch in another house because its what he knew before. Please apply online to speed the process as Sport is in a foster home and will need to be brought to the shelter for you to meet him. In an initial meeting, he will probably come off as a little aloof...not tail-wagging and kisses, but he will warm up after he learns his new surroundings. Please apply online to speed the process since Sport is in a foster home. We want to make sure he is here to meet you. Tiny Tina is a petite 3 year old female Cairn / Yorkie Terrier mix who weighs about 7 lbs and was at a big shelter in MA for a month before coming to Save A Dog. We do not know her history, but she acts like a typical terrier in that she can be feisty, but is very devoted to her people. She will be the love of someone's life. She's generally friendly and will come and sit on your lap or put her paws on you, but until you are her person, she can be skittish, which is typical for a small dog. She will be a great dog for an experienced terrier owner who can work through her quirks with positive reinforcement training. She is very loyal to her people and is good with cats and dogs. She will be someone's best friend in no time. Adult home only. Please apply online to express your interest and we will be in touch. Meet Twister! He is the sweetest dog. Twister is a little lap dog. On Thanksgiving day he spent the whole day on the laps of all the guests at his foster home. He "made the rounds" and they all took turns having a little lap-warmer. He's great on leash and is a good little walker. He was a stray from Springfield and nobody claimed him, which we find hard to believe as he's very house trained and knows what a couch is. He's good with the resident dog. He doesn't chase squirrels so would probably be fine with cats. He likes to have his people home with him and can be anxious if you're gone. On his first night at Save A Dog we gave him a stuffed toy and he wrapped his little paws around it and relished it for a good while. He also likes to stretch out his back legs, froggy style. He's so cute!!! He is going to be a wonderful little companion for someone. Would you have room in your life for this little guy? He has so much personality and deserves a home for the holidays. Please apply online to speed the process as he is in a foster home and we want to make sure he is here to meet you. Thank you! Hi! My name is Weston. 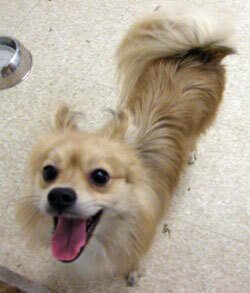 I am a small (8-9#) male Pom/Papillon mix available for adoption. I am great with other dogs, probably fine with cats, never exposed to children. I am crate trained, but I like to be with my people and not in the crate for long periods of time. I have soft, fluffy fur, I like to give kisses, and I am very quiet in the house. I love going on walks and I do well on leash. I was just recently neutered so I am recovering, but I love to play. I am in a foster home so please fill out an application so I can be here to meet you.